A new report has warned the equivalent of a truck of plastic rubbish is being thrown into the worlds’ oceans every minute and that if drastic changes are not made the amount of plastic rubbish in the oceans will outweigh fish by 2050. The worrying research was revealed during the first day of the World Economic Forum talks in Davos, Switzerland yesterday (January 20th) which was attended by Leonardo DiCaprio — who donated $15 million to environmental charities last year. The research shows that more than 8 million tonnes of plastic rubbish end up in the oceans every year and that this is only likely to increase as more plastic is used globally. 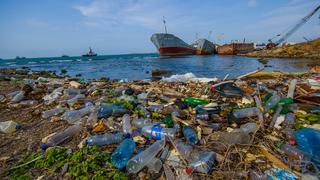 “If no action is taken, this [plastic ocean waste] is expected to increase to two [truckloads] per minute by 2030 and four per minute by 2050,” the report states. The revelations have led to calls for drastic changes in the plastics industry. “This report demonstrates the importance of triggering a revolution in the plastics industrial ecosystem and is a first step to showing how to transform the way plastics move through our economy,” said Dominic Waughray of the World Economic Forum. Plastic waste is considered one of the biggest threats to the world’s oceans and some companies have already taken steps to try and create change. Some of the 12 winners at the inaugural Ocean Awards, held last week, are involved in trying to reduce plastic waste. Pharrell was recognised for his collaboration with G-Star Raw on recycled ocean plastic fashion, Emily Penn was awarded for her research into plastic waste and Selfridge’s ban on plastic bottles as part of Project Ocean was given the corporate and social responsibility award.